Week eleven wasn't bad! Thirteen episodes! -This is the first time the Enterprise crew gets together to play poker--something that would last the rest of the series. -Hey they're in the JAG office! Fun. This makes me picture JAG as a SciFi show. Someone get me CBS on the phone, STAT! -Wesley falls for a girl who's actually less worldly than he is. A-freaking-dorable. She literally says, "You've been SO many places!" -This is the first time Picard orders Tea--Earl grey, hot. Sadly, it comes out all crazy because of, you know, the contagion. -This is the one where they beam into a 20th century hotel and everyone's got lots of moxy. Data learns to play black jack and, in order to escape, Riker, Worf, and Data pretend to be "foreign investors." -Duplicate Picard arrives on a shuttle but his brain is all jacked up. 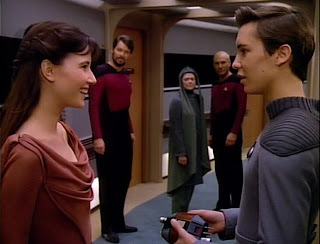 -Riker is offered his own command but his dad comes to give him the what-for. Talk about awkward. -Kyle Riker and Pulaksi had a THING. -Kyle refers to Anbo-jyutsu as the ultimate evolution in the martial arts… we’ll see about that. -Picard takes Deanna to meet his pony. -I have a lot of problems with this episode. Namely, robbing a little girl of her memories. I'm not buying your Prime Directive shtick this time, Picard. 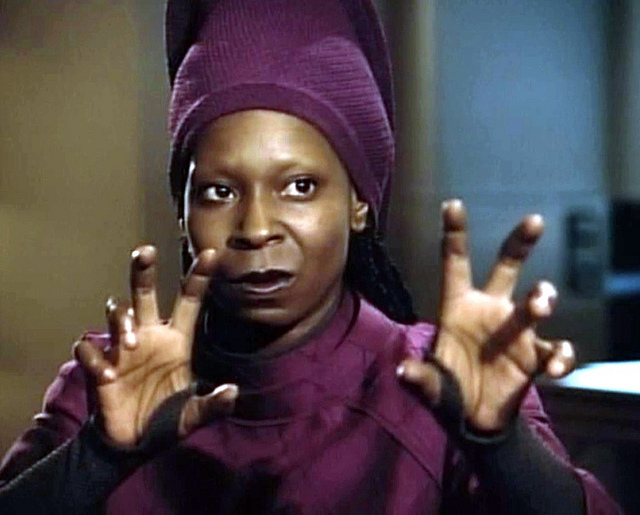 -This is the episode wherein we meet the Borg and, more importantly, we learn that Q is afraid of Guinan. -You are smart. You make our ship go. -Worf and Pulaski share a little secret about Worf having a fainting spell. To repay Pulaski for keeping his secret, Worf brings the doctor a Klingon tea ceremony. This is a great scene. -Oh and also, the Enterprise cargo hold is totally full of basically Irish lads and lasses. -Lwaxana is way into Picard. She beams onboard and makes the captain eat dinner with her. -Most of the virile male staff end up hiding out in the holodeck until Lwaxana's crazy time is over. -She's so likable in this one. It really takes me back to when she was Christine Chapel. -The Enterprise heads out to wake up a bunch of Klingons who've been asleep since wartime. It's too bad they don't have regular, non-turtle foreheads. That seems like a missed opportunity. -I love their solution to this one. So smart! I'll probably write about this "The Emissary" again. -A wormy guy shows up and makes the Enterprise take part in war games to determine their efficiency in a battle scenario. -Pulaski gets Data to challenge the wormy guy to a game of strategema. This is a nice scene. She also tries to give him a pep-talk later. Nice, job doctor. Ok, that's it! I pretty much hit my weekly goal and, since things haven't been quite as crazy in my life lately, it wasn't too hard. Hopefully this week, I'll keep up this pace. I still have a few episodes I'd like to write about from Season 2 before I move on. We'll see how it goes! Did you really watch all those this weekend, or is that from the whole week-- If it's from the weekend only, you are almost as obsessed as I am! Yikes!